Recent release “Hosting the Holidays” from Page Publishing author Jefery Ramon is a timeless account filled with cooking recipes for a hearty holiday cheer. Jefery Ramon, a former paleo and organic food chef in New York, has completed his new book “Hosting the Holidays”: a knowledgeable cookbook containing healthy, delicious, premium foods fit for celebrating special days commemorating the US history and beliefs. Published by New York City-based Page Publishing, Jefery Ramon’s infused book presents a simple and elegant way of combining fresh resources for a wonderful celebration of the holiday spirit. The compendium also includes insightful trivia for each holiday, along with its significance to the society and the reason for its memorable commemorations. 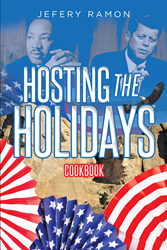 Readers who wish to experience this amazing work can purchase “Hosting the Holidays” at bookstores everywhere, or online at the Apple iTunes store, Amazon, Google Play, or Barnes and Noble.